Returning to school after serving in the military is a challenging, but rewarding, step forward in your career. After dedicating their lives to secure our nation, veterans returning to civilian life could build a more secure financial future. But how? The key just may be taking coursework that helps them land excellent positions at high pay. 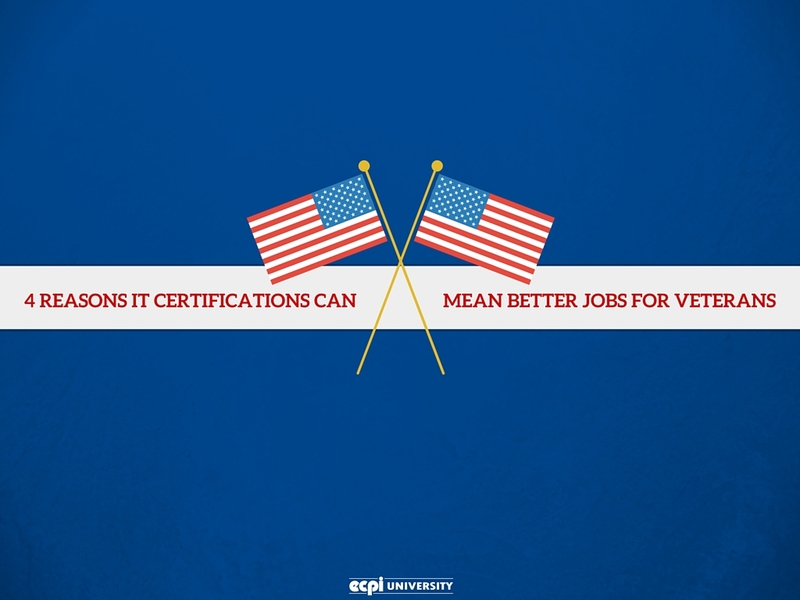 The coursework may not lead to a degree, but with the right IT certification, veterans working in information technology are better able to leverage their military experience into good jobs for four very good reasons. As a veteran, you already underwent some security checks. Depending on the work you performed for Uncle Sam, you may have been vetted by the FBI, the CIA, or the NSA. Your job in the military may have already instilled in you the good work habits of compartmentalizing, keeping information confidential, and practicing good security routines. Employers value—and are willing to pay for—these skills, especially in the competitive world of information technology. Neither program precludes veterans’ use of Post 9/11 GI Bill benefits. Additional programs that cover all or part of your coursework are available through the GI Bill. You can use the GI Bill Comparison Tool to find out what part of your education is paid for by your country; in many cases, your tuition is completely covered. Veterans may feel they cannot earn sufficiently high wages without returning to college for an undergraduate degree. Certification programs, however, can readily compensate for a lack of college education depending on your previous experience or can make your college experience even more valuable. Georgetown University’s Center on Education and the Workforce (CEW) found that high school graduates who attained a certificate boosted their wage earning potential some 20 percent. CEW’s study found that the median high school graduate earned $29,000 while the median high school graduate with a certificate earned $34,946. This actually puts the certificate holder slightly above the earning power of someone who attended college but did not receive a degree. Certificate Holders Working in Their Field of Study get a Significant Earnings Premium—Getting certified in a marketable skill, and then using it in its main industry, provided an average premium of 37 percent over certified workers outside their certified field. Computer and Information Services Certificate Holders Enjoyed the Strongest Premium—If you, as a veteran, earn an IT certification and work in IT, you could earn 115 percent more than someone earning an IT certification who does not work in IT. No other field comes close to matching this earnings premium. 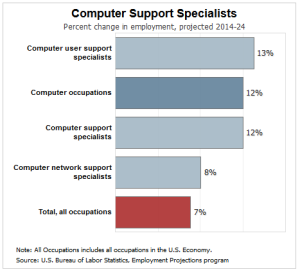 Take “computer support specialists, for example, which is a job attainable through many paths, including certification rather than an undergraduate degree. The BLS notes that the 2014 median pay for this position was $47,610 per year across all industries using these specialists. For an occupation that can be attained with as little as 200 hours of certification work, these wages are considerably higher than the BLS’s calculated median annual wage of all occupations, $35,540. ECPI University’s Professional Development Center is specifically geared to provide today’s veteran with efficient, productive coursework in certificate programs approved for veterans, even while you continue in your current work. Contact ECPI’s Professional Development Center today to learn how your veteran’s benefits can truly benefit you.